You know how we're an art family...: Pantry Moths? Did you know there were moths who prefer flour to wool sweaters? Me neither...until we ended up with an infestation in our pantry. *sigh* It all started innocently enough with a single moth that I thought had slipped in when the backdoor was open one night. I didn't know how it had become trapped in the pantry, but I shooed it out with the broom and didn't think much else about it. Until it was back the next day. Strange, so I shooed it out again and noticed later that day, there were two. Again, not thinking much about it, until about 4 days later when I opened the pantry and there were probably 30 in there! What?! Like eve ry good internet junkie, I googled "pantry" and "moth" and found out there are, indeed, pantry moths. 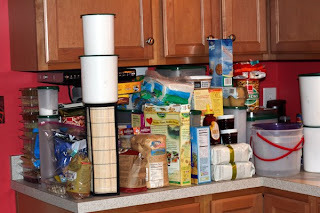 So out with EVERYTHING in the pantry, which ended up being a fantastic excuse to throw out countless small amounts of things we would never eat, and in with the pheromone traps. The next time I find a random moth loitering near the pantry, instead of shooing it out, I will be beating it senseless lest it decide to procreate (is that what they do?) near my foodstuffs again. Lesson learned. Oh well, live and learn! At least you have an excuse to clean your pantry! Ok, I completely understand. The newly-cleaned pantry I wrote about today just may ....*may* have been cleaned out to a little ant infestation!